Tag words: bacterial growth, growth curve, lag phase, exponential growth, generation time, viable cell count, continuous culture. Measuring techniques involve direct counts, visually or instrumentally, and indirect viable cell counts. 1. Direct microscopic counts are possible using special slides known as counting chambers. Dead cells cannot be distinguished from living ones. Only dense suspensions can be counted (>107 cells per ml), but samples can be concentrated by centrifugation or filtration to increase sensitivity. A variation of the direct microscopic count has been used to observe and measure growth of bacteria in natural environments. In order to detect and prove that thermophilic bacteria were growing in boiling hot springs, T.D. Brock immersed microscope slides in the springs and withdrew them periodically for microscopic observation. The bacteria in the boiling water attached to the glass slides naturally and grew as microcolonies on the surface. 2. Electronic counting chambers count numbers and measure size distribution of cells. For cells the size of bacteria the suspending medium must be very clean. Such electronic devices are more often used to count eucaryotic cells such as blood cells. 3. Indirect viable cell counts, also called plate counts, involve plating out (spreading) a sample of a culture on a nutrient agar surface. The sample or cell suspension can be diluted in a nontoxic diluent (e.g. water or saline) before plating. If plated on a suitable medium, each viable unit grows and forms a colony. Each colony that can be counted is called a colony forming unit (cfu) and the number of cfu's is related to the viable number of bacteria in the sample. 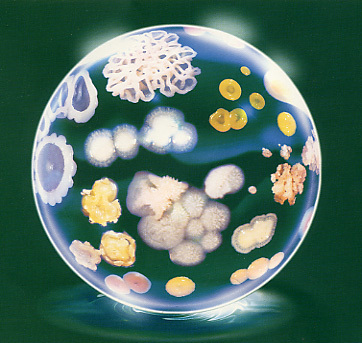 Advantages of the technique are its sensitivity (theoretically, a single cell can be detected), and it allows for inspection and positive identification of the organism counted. Disadvantages are (1) only living cells develop colonies that are counted; (2) clumps or chains of cells develop into a single colony; (3) colonies develop only from those organisms for which the cultural conditions are suitable for growth. The latter makes the technique virtually useless to characterize or count the total number of bacteria in complex microbial ecosystems such as soil or the animal rumen or gastrointestinal tract. Genetic probes can be used to demonstrate the diversity and relative abundance of procaryotes in such an environment, but many species identified by genetic techniques have so far proven unculturable. Figure 2. Bacterial colonies growing on a plate of nutrient agar. Hans Knoll Institute. Jena, Germany.